Description: In Shogo you play Sanjuro, a hotshot commander caught in the middle of a war against a terrorist organisation that cost him his family and his girl-friend. As the plot develops, you will find out that not everything is as you thought it was. But make no mistake: Shogo is all about furious 3D action. I have heard the alot of ppl has got problem with this game and nvidia geforce 2 cards. I just want to say that I don't have those problems. I have only played the deom and it rocks!! Date: 2003-01-03 05:12:52 User: risc Subject: Great game! I bought it a while ago, and played it for ages, I haven't played it in a long time though and may reinstall it. 4 Stars! Above I gave this game 4 stars, but I've just taken the time to reinstall it, and on my new hardware the game runs way too fast to be playable. Worked great with my old GeForce 2 GTS though. IIRC, you will need to limit the frames per second to 30 - otherwise, you have all sorts of graphical and other issues. This is a config option for the Windows version, but I'm not sure where this is set under GNU/Linux. It's a top notch game if you can play it. yes, i have a geforce 2, 400MX siluro, and the game plays great, but the Load Game, Save Game, and Single Player options are not visible, i can only have 1 save game by pressing F6, and load it with F7, because the menu is not visible by good luck i press enter to start the game, very strange, i see it with other games, i supect directx 9 is the reason. Can I download the linux client and use the Windows CD that I already own, or must I purchase the game again, from TuxGames (or try to run it in WineX)? I realize that Hyperion gets no money from people using their old CDs, but it sure would be convenient for me. Date: 2004-06-22 08:23:22 User: stevenaaus Subject: Win***s version is great. Haven't seen this port, but kudos to companies for trying. I played this game through 80%. The Lithtech engine is quite solid. One of the best FPS ever. Ever heard of going Hardware reendering at max res....Some poeple, look this is one the best running FPS only outshined by Doom and Quake series for Linux. So please don't shoot a game becuase of your mistakes and please take your foot out you look like a loony toon with it in your mouth. Date: 2005-12-06 02:26:31 User: Rogue Jedi X Subject: Wow! Big guns! 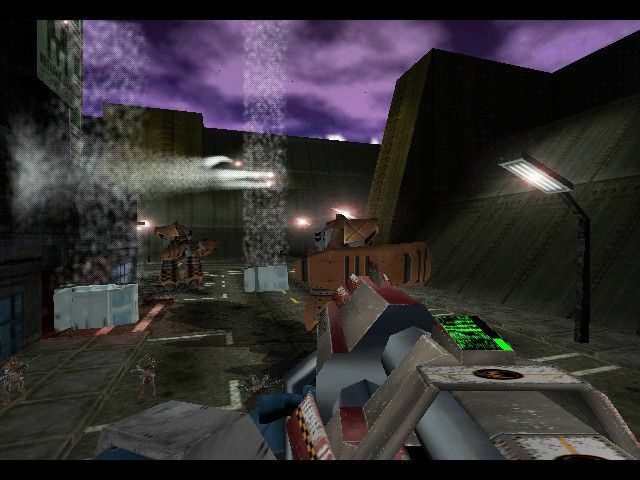 A FPS with mechas. What's not to like? I've played this game on Windows once and liked it. Just tried the demo and the only thing bothering me is that I can't adjust the brightness, so I won't rate it just yet. hmm sorry to say atleast on my computer (3700+ AMD 64) even with the fps limited to 30, it does not actually take into effect. i open this autoexec.cfg with notepad, and add in the line "Max FPS" "30", yet the game still plays too fast...hmm i am still determined however to get this classic up and running! Date: 2007-05-02 02:03:25 User: anonymous Subject: upadtes? Thanks a lot for this hint, it works perfectly with frame limitation enabled (even on a 64 bit system). The first two don't work, but if you click the Buy Shogo link, there is a link to the demo on that page. Running on a Core Duo e6750 and a 8800GT 512mb. Date: 2008-03-03 17:43:56 User: Piga Subject: Re: Wow! Big guns!